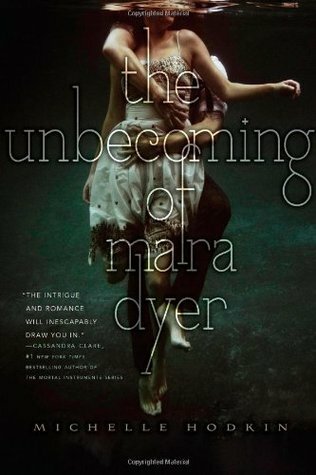 Review: The Unbecoming of Mara Dyer - Book.Blog.Bake. Hmm. I finished reading The Unbecoming of Mara Dyer two days ago, and I’m still unsure of my feelings. The first part of this book and the second part of this book read like almost two separate stories to me. The first part is mainly about Mara dealing with her PTSD, which is pretty understandable and quite interesting. It’s well-written, intriguing, and emotional. The second half, when the paranormal part of this book starts to play in, is fast-paced, adventurous and even though it sets a really great creepy mood at times, is much less emotionally compelling. I think I liked the first half of the book more, even though I knew the paranormal was going to creep out at any moment. I’m actually about to start this book, it’s been on my bookshelf for over a year. I’m glad you liked it, but I’m not sure how I feel about Mara being unlikeable. And I’ll have to see what I think of the pacing, too. Great review! A lot of people really liked Mara, I think, so maybe you will too! I felt pretty much the same way. However, I had no idea that there was a paranormal aspect to the story, so it really surprised me. I read the 2nd book recently and liked it even more than the first. Mara is messed up but I feel you get to know her better in the 2nd book. ANd you get to know Noah a lot better. Good review! The ONLY reason I knew there was a paranormal aspect to the story was because I read a few blog reviews before I read the book. I wish the blurb on the book made it more clear that it was paranormal.